Critical Studies in Television publishes a series that draws attention to the inner workings of the different archive partners within EUscreen. This month the focus is on the TV Archives of Slovenia. 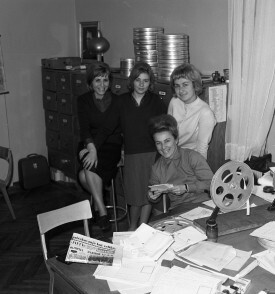 The archives were established in 1958, when Slovenian television started to broadcast their programmes. Radio Ljubljana had begun with a regular programme on 28 October 1928, while Radio Free Ljubljana had started to broadcast after the Second World War on 9 May, 1945 – liberation day. The material covers important political events such as the beginning of the war of independence, federal soldiers leaving Slovenia at the end of the war in 1991and the creation of the new state in 1991 and its declaration of independence, as well as significant national events such as the celebration of international worker’s day in 1964, the visit of Pope John Paul II and the plebiscite for an independent Slovenia with a live broadcast from the press centre. The material also documents day to day life in Slovenia and includes an eclectic selection of programme footage including coverage of children being vaccinated against Polio in 1961, a day among the fishermen on the Sora River in 1970, the dangers of pollution and environmental concerns, a programme covering the mating habits of the moor frog which causes them to turn blue and the discovery of the world’s oldest musical instrument at Divje Babe, a flute which could date back to the time of the Neanderthals. You can read the full article online at the Critical Studies in Television website. Next up in this series there will be articles from KB (Sweden), Sound and Vision (The Netherlands), ORF (Austria) and INA (France).